The online contest is interactive, visually attractive and uses audio for a more rounded test of English comprehension. Participants have 45 minutes to answer 45 questions. In addition to reading comprehension, vocabulary, grammar, pronunciation, culture and expressions, the online format allows oral comprehension to be tested too. This demo is interactive. Feel free to give it a go! The contest can be accessed by computers or tablets with an Internet connection. Several contest sessions can be arranged throughout the day if there are not enough computers/tablets for all students to take the test at the same time. With no test papers to receive or send, organisation is very simple! Use the links below to look at previous years’ Big Challenge contests. What happens the day of the contest? Students are given a 45-minute session to complete the contest. This session may be scheduled at any time during the day to accommodate teachers’ and school schedules, preferably in the morning. To facilitate organisation, and to adapt to schools’ capacities in terms of computer equipment, several sessions may be scheduled the day of the contest: one session for each level for example. In exceptional cases where the date may prove impossible for the school or for certain classes, a special dispensation may be granted to hold the contest at an earlier date. The test is taken online on a computer or tablet which must be connected to the internet for the duration of the test. It is comprised of 45 multiple-choice questions. For each question, there are four answers proposed. Contestants must select the one and only possible answer. The 45 questions, testing oral and written comprehension, cover vocabulary, grammar, pronunciation, conversation situations and civilisation. Each class level has its own specific set of questions that correspond as closely as possible to school programmes as outlined in the CEFR. The test is strictly individual and takes place with no outside assistance or accessory of any kind (book, dictionary…). The test is supervised by a teacher or a member of the teaching staff who guarantees its proper conduct. What personal information do students need to provide? Just before the test begins, students must open the contest web page and select their school’s region, city and name. They must then enter their school’s Big Challenge code which will have been given to the Coordinator a few days earlier. 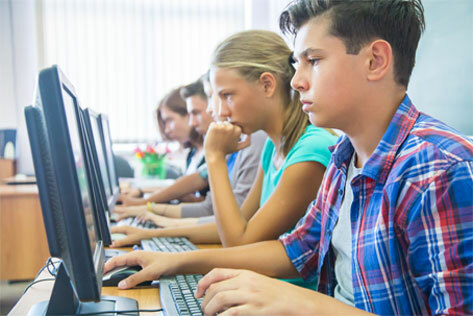 This will give them access to a page where they must then enter their surname, first name, date of birth, class name and tick the box indicating their class level. They may then click on the START button to begin the test. 45 minutes later, they will no longer have access to the contest web page. What should students do if they don’t know the answer to a question? If students can eliminate one or two answers, and are hesitating about the remaining two answers, it would be better to make an educated guess. If they have really no idea which of the four answers is correct, then it’s better not to answer at all. If students apply this method, it will give them an advantage in the end. Students who answer randomly will have a final score close to zero. With one chance out of four of choosing the correct answer (and thus earning 5 points) and the risk of losing a quarter of the question’s value (1.25 points) with an incorrect answer, statistically they will end up with zero. On the contrary, a student who isn’t sure of the correct answer, but thinks carefully and is able to eliminate two answers out of the four, will have a distinct advantage. Taking the time to think carefully before making a choice is clearly the best way to succeed. Of course, that is what we hope to teach our students in general: to think carefully before giving an answer! Some of my students were absent the day of the contest. Can we get a refund? Starting in February, we begin pre-ordering the prizes and we confirm our orders as soon as registration is over in March. That is why, from March on, we simply cannot make any refunds. However, even if students are absent the day of the contest, the school will still receive prizes for the total number of students registered whether or not they are present the day of the contest since these prizes have already been purchased and cannot be stored from one year to the next.